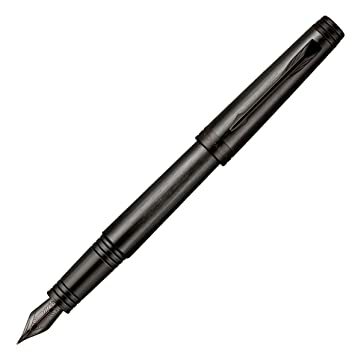 The Parker Premier Black Edition Pen…….who would have thought a plain old black pen would be such a hot seller! Well, the reality of it is, the Parker Premier Black Edition Pen is far from ordinary! The incredibly futuristic appearance of this amazing pen is the result of the combination of the latest technological advances in pen development and the famous Parker craftsmanship that has kept it a front-runner in the world of pens since its’ inception in the late 1800’s when George S. Parker founded the company. By combining two precious metals from the platinum family, Parker Pens has not only developed an aesthetically pleasing looking pen, they have produced a pen of immense strength; the body of the pen will not chip, fade or corrode. The most amazing feature of this pen is its’ unique black nib. Through a new, cutting edge ruthenium plating process, Parker has broken through the barriers of the latest pen technology and produced a nib that is different in appearance than any nib manufactured before it , with superior writing capabilities and longevity as well! As always, with the Premier Black Edition, Parker continues to use the highest standards of assembly and the best quality control in the market place; each pen goes through thirty processes and is hand polished and checked and re-checked before leaving the Parker facility. The Parker Premier Black Edition Pen, the latest gem in Parker Pens long history of pen innovation, is now available at Executive Essentials! It’s tax season all around the United States. For those who overpaid it’s a time of joy, an occasion to expectantly check the mail or log into our bank accounts. For everyone else…it’s just tax season. As Americans, we started paying a federal income tax in 1861 and 1862 to pay for the Civil War. During this storied time of civil unrest, young men on both sides were using smooth-bore, long-barreled muskets and keen-edged sabers to solve the nation’s differences on the field of battle. But, off the battle field they were using quills and dip pens to write letters of their experience and re-connect with their friends and family back home. Quills had a short life span and were easily breakable, especially in the pockets of young soldiers tramping around the countryside from skirmish to skirmish. Metal tipped dip pens were more durable, but also more expensive and rare. But, even though the typical soldier of the Civil War era relied heavily on quills, dip pens and even pencils, it doesn’t mean the fountain pen didn’t exist in America. Peregrin Williamson, a Baltimore shoemaker, received the first American patent for a fountain pen in 1809. Later, in 1831, John Jacob Parker patented the first self-filling fountain pen. However, these early fountain pen models were fraught with mechanical problems that led to ink spills and other inadequacies that left them impractical for the average user and thus hard to sell. All that would change, however, after the Civil War. As the war ended and the healing process began, the nation once again turned it’s eyes on innovation and technology. During this period the fountain pen in America would begin to take shape as we know it today with the addition of what many consider the first practical fountain pen produced by Lewis Waterman. Countless others followed. Modern fountain pens have changed drastically from their civil war era counterparts, as has the tax code that initially sprung up to help fund the war. But, what hasn’t changed is our connection to our written language and the instruments we use to lay our thoughts out on paper. As collectors we still yearn for that perfect writing instrument to pen the great American novel, draft that world-renowned play or simply write a letter back home. At the very least we’ll need something to sign our taxes with this season. Which reminds me, if you need any help figuring out what to do with your return this year, might I suggest something along these lines? Graduation time has come to Montana. I know this very well, because last weekend I gathered up my two children, dressed them up in the finest threads we have to offer and ushered them 12 blocks to the University of Montana where they watched their mother graduate with an English Major and Sociology Minor. I’m incredibly proud of my wife for persevering through the trials and tribulations that came from raising a family (husband included) while wrestling with the studies of critical interpretation and social ethics. Good job babe! But with the joyous rapture of graduation weekend comes the sobering and somewhat mournful realization that the last 4-5 year journey had a purpose. And that purpose – for most – was to get a J.O.B. As the newly minted 2011 graduates explode across the social landscape, fulfilling want ad positions more efficiently than the city’s public works department fills potholes after the spring thaw, it’s our hope that they are capable of finding jobs that not only pay well but that they like. This task alone is harder than any final they’ve ever dared take. In that vein, I thought it would be appropriate to introduce our readers to some folks who truly do love their jobs. Those are the people here at Executive Essentials. These are the folks who research, organize, filter and coordinate your orders. These are the very people that work with you at Executive Essentials to ensure that you have access to the finest pens the industry has to offer and that you receive exactly what you thought you were getting when you thought you were getting it. And it’s no small task. With all this experience and knowledge and love of their job, it’s no wonder that a few of them might have some opinions about their favorite pens in the EE catalog. So here are a few of the staff and their favorite Executive Essentials pens. Ellen Bjorvik is the general manager for Executive Essentials as well as a pen buyer and expert on all things writing. As a general manager, Ellen’s job requires a great deal of knowledge about the organization as a whole and the ability to multitask at a high level. She loves the Parker Duofold Pearl and Black ballpoint pen above all the rest. She enjoys this pen because of its gorgeous, classic beauty and the ease with which it writes due to its extremely well-balanced nature. Sandy Langenfeld works at Executive Essentials as a customer service representative and is also one of the local pen experts you will find helping when you order. Sandy is in love with the Retro 51 Tornado in Purple which will be her next pen purchase. She likes the Tornado in Purple because she can use the easy flow refills with this ballpoint for a rollerball-like writing experience. Sandy also likes the Waterman Exception Rollerball in Raspberry for both the unique shape as well as the beautiful, feminine color. Sylvia Draganova is another knowledgeable customer service representative at Executive Essentials that can answer all your questions and offer suggestions based on your writing needs. As one of the many pen experts on the staff, she has many opinions about the best pen brands and individual writing instruments. Her favorite pen brand is Faber-Castell and her favorite pen is the Graf von Faber-Castell Classic Collection of Wood Pens and the Emotion Collection of Wood Pens which are a bit more affordable. She appreciates that these pens use a natural, sustainable resource –wood – and also admires their classic elegance. But above all else, she loves that the company is family owned, just like Executive Essentials. Renee Silverman is the Director of eCommerce for Executive Essentials and in charge of making sure the website, blog and online catalog are looking good and in working order — among a variety of other duties. Although she is a self-professed ‘non-expert’ she knows what she likes when it comes to writing instruments, having been in the pen business for a few years. She adores the Metropolitan Museum of Art line of pens, specifically the Tiffany Pine Bough Rollerball. She is drawn to the Tiffany Rollerball specifically because of its elegant and beautiful exterior and its smooth writing feel, all of which remind her of Tiffany art. Her other favorite pen is the Montblanc Ingrid Bergman La Donna Limited Edition Rollerball. She loves the unique, feminine shape of this pen, especially the amethyst accent! But the attribute that really causes this pen to stick out to her is the unique contrast between the mother of pearl cap and the black body. Very striking. Those are just a few of the suggestions from the wonderful people at Executive Essentials. These are the people that are ready to answer any of your questions about any of the pens you might find. So don’t be shy. When I tell people that I write for a pen blog, often the response that I receive is a stalled and glum, “I’m sorry.” I’m always amazed at that response. I’m amazed at the lack of interest people have in items they deem mundane and at their lack of interest to learn or ask questions. I do understand that most of these folks view pens and writing instruments as, well, utilitarian tools. To these false apologists, the pen is a necessity, not an extravagance. It’s an item made for the glove box and the cracks between the seats in the car, not the executive desk or the mantle. To them, talking about pens and the various qualities they possess is like squeezing toilet paper in the grocery store before you buy it – regardless of how soft any certain brand is, you’re going to use it all for the same thing. The truth is pens are all used for the same thing – to write. But writing starts with an inspiration and the proper tools. And, in the world of fine writing instruments, the perfect tool can be the inspiration. When you hold a perfectly weighted fountain pen tipped with a well-calibrated nib, flexing with just the right touch, words will spring to life. Thick, inky lines of text will spin tales of faraway places, soaring music, daring deeds, and well-timed speeches. One of the finest inspirational brands is Parker pen products. This is a company that understands quality with a very broad range of pen styles. The Parker Pen Company was founded in 1891 by George Safford Parker and from the early 1920’s to the 1960s the company held steady at number 1 or number 2 in sales worldwide. 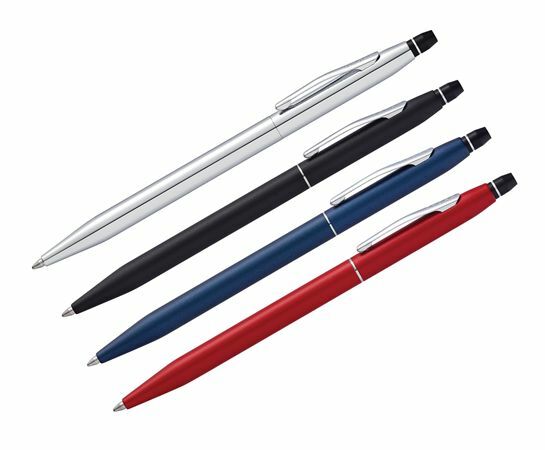 Parker ballpoint pens are still one of the most widely used pens on the market due to their reliability and durability. But, Parker’s line of pens is larger than just ballpoints. Parker boasts an innovative line of pen types including Parker Fountain Pens, Parker Jotter Pens, and Pen Sets. Three of my favorites are the Parker Premier Fountain Pen in Black Lacquer, the Parker Jotter Ballpoint Pen Black Chiseled Stainless Steel and the Parker Latitude Ballpoint Pen in Icy Silver. All three of these pens embody the rich character and design that Parker has become known for and each offers their own unique inspiration to the world of pens. So take the time to dive into Parker and their products. But better yet, take the time to learn a little bit more about the writing instruments that have for far too long been taken for granted. I think you will be surprised at what you find. Memorial Day is a great holiday. Not only is it a day of remembrance for those who have died in the service of the United States of America, but it’s also a three day weekend, reserved for family and friends. In my part of the country, Memorial Day Weekend means outdoor grilling, story-telling, lawn-darts and intermittent showers interrupted by bursts of sunshine. It’s warm, but not too warm. Wet, but not too wet and the three days always seem to end too soon. I know a lot of friends who take the three day weekend and turn it into a time to get things done around the house. They do some portion of yard work or take a few days to clean out the attic or the garage. Basic things to get ready for the summer. That’s all fine and good, but I think Memorial Day Weekend is best doing the things you want to do, not the things you need to do. A few weeks ago I started to look into the Parker brand of pens and ever since then, I’ve wanted to sit down and take a more in-depth look at some of the collections and the individual pens they have to offer. So, on a Memorial Monday, I strolled through the Executive Essentials catalog and took a look around at what they have to offer. It’s been a great holiday and browsing through these amazing writing instruments has been a great capstone. The Parker Sonnet Ballpoint Collection contains a whimsical and stylish cadre of pens. The Sonnets have a consistently slim barrel that makes them almost lady-like. Attach that to the gold and black cross hatching on many of the individual pens or the gold and silver trim and flourishes and you have yourself a very feminine pen. 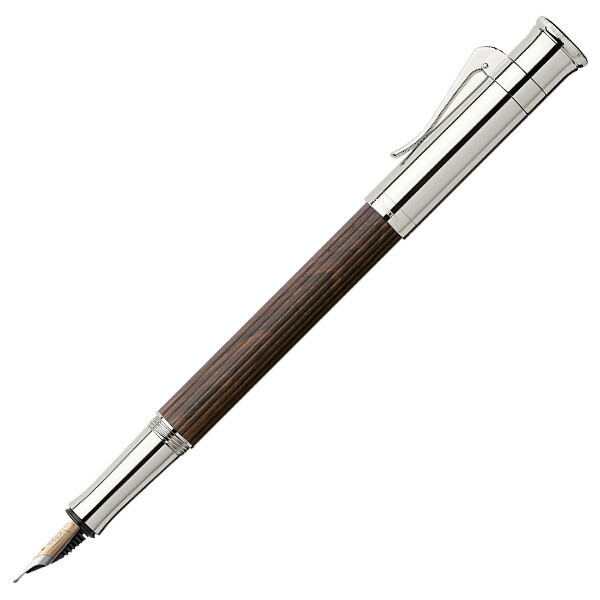 Even the jet black and silver versions have a business-women essence that permeates the character of these pens. My standout favorite of the bunch is the Sterling Silver Sonnet Ballpoint which features a sterling silver finish with a chiseled design while the nickel palladium trim gives the pen a modern and sophisticated look. A real keeper. 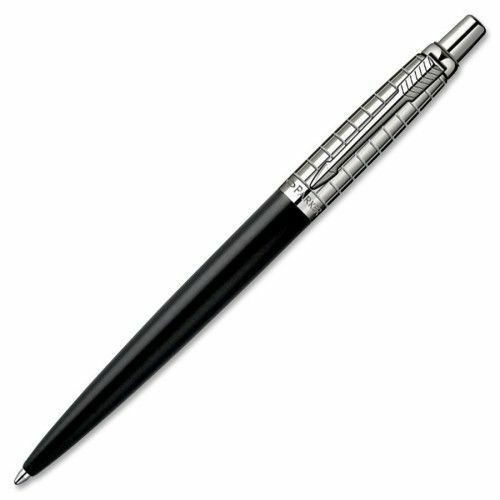 It may be that the annual Sci-Fi and Fantasy Convention just happened this weekend in my town, but the first thing I thought of when I saw the Stainless Steel Jotter Ballpoint by Parker was silver bullets and werewolves. Lot’s of companies make a stainless ballpoint pen, but none do so with the design and determination that Parkers Jotter has. This pen is streamlined and bullet-like. It has a just enough breadth of the barrel to make it gender unspecific yet it somehow remains elegant and dangerous all at the same time. The minimal amount of chiseling on the chest of this pen gives a bit of variation and flair. As much as the Sonnet and the Jotter draw from standard pen designs, Parker’s Urban Metallic draws from more modern influences. The Urban has a unique body and shape that demands to be held. The ergonomic curves from tip to cap give the Urban a great feel when writing and a remarkable look that stands out from the pack. Whereas many pens rely on the starkness of black on metallic for a cool, clean feel, the white stood out to me as a more understated design that works well in conjunction with the round curves of this pen. The classic Parker pen clip binds the entire design together. This is a smart pen with much to talk about. Here’s hoping you had a great Memorial Day Weekend and that you had the time to see those you wanted to see and do those things you wanted to do.